Ever youthful and spirited, Mirella Freni is consistently acclaimed as the last of a great line of Italian sopranos. 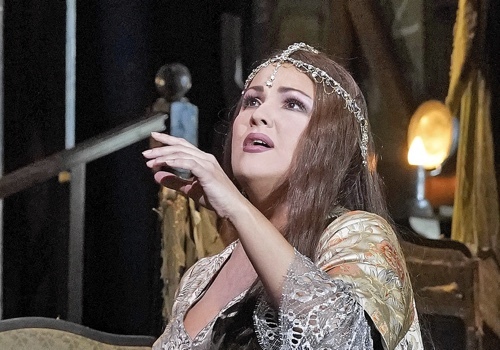 Her performances, richly nuanced, remain a lesson in the art of bel canto singing. Universally acclaimed as the greatest Mimì of the last fifty years, the international press invariably praises her for sensitive phrasing, a full palette of vocal colors and her ability to discover some new musical or dramatic truth in every performance. On 15 May 2005 the Metropolitan Opera celebrated Mirella Freni’s seventieth birthday, her fiftieth anniversary on the operatic stage and her fortieth anniversary with the Company. The occasion served as the legendary diva’s unannounced farewell to a long and celebrated career. Today, Ms. Freni remains active conducting Master Classes in Europe, North America and Asia. She recently conducted a series of Master Classes for the Metropolitan Opera’s Lindemann Young Artist Program in addition to Master Classes in Innsbruck, Austria and Lubeck, Germany. She also conducts extended classes in voice at the Academy of Vocal Studies in Vignola, Italy near Modena. Mirella Freni made her professional debut as Micaela in Carmen in 1955 in her hometown of Modena and, over the following several seasons, sang at most of the leading Italian opera houses. She made her La Scala debut in 1963 as Nanetta in Falstaff and the following year; she achieved immediate international stardom there, when she was cast by Maestro Herbert von Karajan as Mimì in a new production of La Bohème staged by Franco Zefferelli. Within a short period of time, guest appearances took Ms. Freni to the world’s most important opera houses, including the Vienna State Opera, where the prestigious title “Kammersängerin” was conferred upon her by the Austrian Government. In North America, the soprano made her Metropolitan Opera debut in 1965. On that occasion, as on the occasions of debuts in San Francisco, Chicago, Houston, Philadelphia and Miami, the role of Mimì served as her calling card. In 1970, Ms. Freni began a judicious transition from the purely lyric repertory to that of certain spinto roles, when she starred with Jon Vickers in a new production of Otello at the Salzburg Festival. The conductor was Maestro von Karajan who, perhaps more than anyone, had a profound influence on her career. Other conductors with whom the soprano has enjoyed extended collaborations include: Claudio Abbado, Roberto Abbado, Carlo Maria Giulini, Carlos Kleiber, George Prêtre and the aforementioned Maestri Levine, Muti, Ozawa and Sinopoli. During the ‘70’s and ‘80’s, Mirella Freni continued to expand her repertory by undertaking major Verdi, Puccini and Russian operas, e.g. Don Carlo, Aida, Ernani, Manon Lescaut, Eugene Onegin and Pique Dame. In recent seasons, she has explored the verismo repertory, adding the title roles of Adriana Lecouvrer, Fedora and Madame Sans Gène and The Maid of Orleans. Many of Ms. Freni’s distinguished video performances from the Metropolitan Opera, La Scala, Paris Opera and the Vienna State Opera are currently released on DVD. Most recently, Deutsche Grammophon has released the Metropolitan Opera telecasts of Don Carlo and Fedora with Ms. Freni and Placido Domingo. Ms. Freni makes her home in her native town of Modena, Italy where she enjoys being with three generations of family and following Italian soccer with great gusto.